China’s trade and inflation figures for January will hit the markets early on Thursday and Friday, respectively. Forecasts point to further weakness, which may spell some trouble for “China-sensitive” currencies like the aussie. That said, the far bigger driver for market sentiment will likely be any updates in the US-China trade talks, the latest round of which concludes in Beijing on Friday. The Chinese economy continued to slow at the beginning of 2019, if the forecasts for the upcoming indicators are anything to go by. Exports and imports are both expected to have contracted again in January on a yearly basis, with exports seen falling by 3.2%, a slower pace of decline compared to December’s 4.4% drop. However, imports are projected to have dipped by 10.0%, faster than the -7.6% previously. On the price front, consumer prices are expected to have held steady at 1.9% annually, well below the central bank’s 3% target. Meanwhile, the more closely watched producer price index is anticipated to have cooled to a mere 0.2% in yearly terms, from 0.9% in December. If confirmed, this would be particularly discouraging, as it would signal that factory demand in the world’s second-largest economy continues to weaken, spelling downside risks for both domestic and global growth. 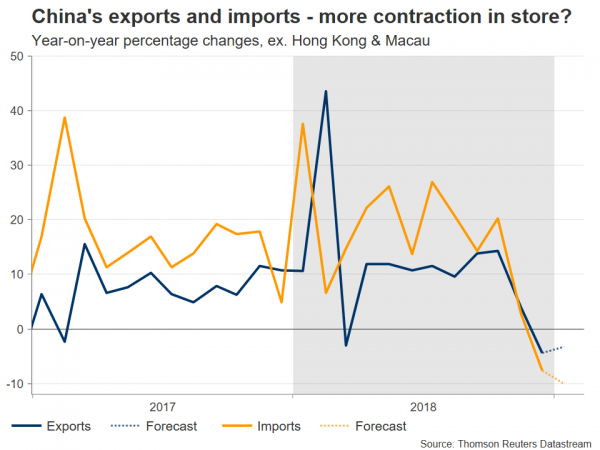 An overall soft set of prints could amplify concerns around the Chinese economy, and by extent push the yuan and the Australian dollar lower. Since China is Australia’s largest export and import partner, the aussie is typically correlated with developments in China, as they tend to be reflected in Australia over time. Looking past economic data, another – and probably more important – variable for the aussie’s overall direction will be what signals come out of the latest round of US-China trade negotiations, which will conclude on Friday. Optimism that a solution will be reached is riding high, following news that President Xi will meet with US negotiators himself this week, and remarks from President Trump that he would consider extending the March 1 deadline for raising tariffs if a deal is close by that point. In particular, it seems the US may be willing to settle for a “smaller victory” that doesn’t necessarily include major concessions on issues like IP theft and forced technology transfer, but instead focuses on eliminating the trade deficit, curbing industrial subsidies, and opening up Chinese markets. This is evident by the fact that the conversation has shifted to the enforcement mechanisms of any deal, like a clause that automatically reintroduces tariffs if the accord is violated in the future. In any case, for financial markets overall, the specifics of any deal may not matter as much as actually getting a deal done, and by extent taking the trade war risk off the table. Technically, a pullback in aussie/dollar – perhaps on soft Chinese data – may stall initially around 0.7050, with a downside break opening the way for the January 2 trough at 0.6980. Even lower, support may be found around 0.6825, a zone marked by the January 2016 lows. On the other hand, advances in the pair – for instance on the back of encouraging trade news – could encounter immediate resistance at the 50-day simple moving average (SMA), currently at 0.7141. A bullish break could see scope for a test of the 0.7295 area, where the 200-day SMA is also roughly located. Beyond the Chinese and Australian currencies, any major surprises in these data or developments in the trade saga could affect broader risk sentiment as well, impacting stock markets and safe-haven assets.